A study published March 21, 2017 in the journal Science summarizes the types of surface changes observed during the two years that the European Space Agency’s Rosetta spacecraft spent investigating comet 67P/Churyumov-Gerasimenko. Notable differences are seen before and after the comet’s most active period—perihelion—when it reached its closest point to the Sun along its orbit. “Monitoring the comet continuously as it traversed the inner solar system gave us an unprecedented insight not only into how comets change when they travel close to the Sun, but also how fast these changes take place,” said Mohamed El-Maarry, a comet researcher at the University of Colorado, Boulder and the lead author of the study. The changes are linked to different geological processes: weathering and erosion, sublimation of water ice, and mechanical stresses arising from the comet’s spin. Weathering occurs all over the comet, where consolidated materials are weakened—such as by heating and cooling cycles on daily or seasonal timescales—causing their fragmentation. Combined with heating of subsurface ices that lead to outflows of gas, this can ultimately result in the sudden collapse of cliff walls, the evidence of which is apparent in several locations on the comet. A completely different process is thought to be responsible for a 500-meter-long fracture spotted in August 2014 that runs through the comet’s neck in the Anuket region. This fracture was found to have extended by about 30 meters by December 2014. This is linked to the comet’s increasing spin rate in the lead up to perihelion. Furthermore, in images taken in June 2016, a new 150 to 300-meter-long fracture was identified parallel to the original fracture. 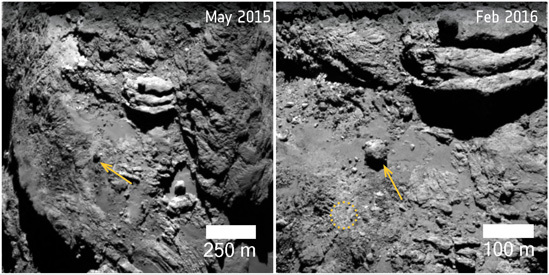 Close to the fractures, a four-meter-wide boulder moved by about 15 meters, as determined by comparing images taken in March 2015 and June 2016. It is not clear whether the fracture extension and movement of the boulder are related to each other or caused by different processes. A substantially larger boulder, some 30 meters wide and weighing 12,800 tons, was found to have moved an impressive 140 meters in the Khonsu region, on the larger of the two comet lobes. It is thought that the boulder moved during the perihelion period, as several outburst events were detected close to its original position. The movement could have been triggered in one of two ways: either a large amount of underlying material eroded away, allowing the boulder to roll downslope, or a forceful outburst could have directly lifted the boulder to the new location. Erosion caused by the sublimation of material, and deposition of dust falling from outbursts, are also thought to be responsible for sculpting the landscape in different ways. For example, scarps in several smooth plains have been observed to retreat by tens of meters and at a rate of up to a few meters per day around perihelion. Furthermore, in the smooth plains of the Imhotep region, previously hidden circular features and small boulders have been exposed by the removal of material. In one location, a depth of about three meters had been removed, most likely through the sublimation of underlying ices. Changes were also noted in the comet’s smooth neck region, near distinctive ripples that were likened to Earth’s sand dunes when they were first identified. Close monitoring of the ripple formations showed this location to also display expanding circular features in the soft material that reached diameters of 100 meters in less than three months. They subsequently faded away to give rise to new sets of ripples. The researchers speculate that the repeated development of these unique features at the same spot must be linked to the curved structure of the neck region directing the flow of sublimating gas in a particular way. Another type of change is the development of honeycomb-like features noticed in the dusty terrains of the Ma’at region on the comet’s small lobe in the northern hemisphere, marked by an increase in surface roughness in the six months leading up to perihelion. Similar to other seasonal changes, these features faded substantially after perihelion, presumably as a result of resurfacing by the deposition of new particles ejected from the southern hemisphere during this active period. “This documentation of changes over time was a key goal of Rosetta’s mission, and shows the surface of comets as geologically active, on both seasonal and short transient timescales,” said Matt Taylor, Rosetta project scientist for the European Space Agency. The scientists also note that although many small-scale localized changes have occurred, there were no major shape-changing events that significantly altered the comet’s overall appearance. 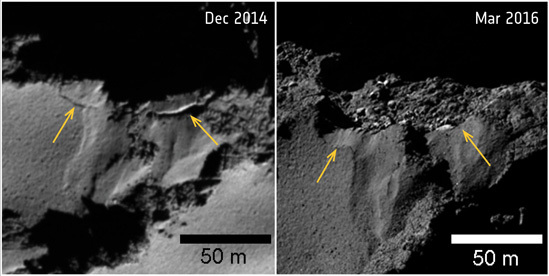 Ground-based observations over the last few decades suggest similar levels of activity during each perihelion, so the researchers think that the major landforms seen during Rosetta’s mission were sculpted during a different orbital configuration. This release is adapted from text supplied by the European Space Agency. The research paper, “Surface changes on comet 67P/Churyumov-Gerasimenko suggest a more active past,” Mohamed El-Maarry et al., was published March 21, 2017 in the journal Science. The Rosetta mission is operated by the European Space Agency with national agencies funding the instrumentation and scientific activities. University of Maryland participation in the OSIRIS camera team is funded by NASA’s Jet Propulsion Laboratory (Contract # 1267923) and a Gauss Professorship from the Göttingen Academy of Sciences (to Michael A’Hearn). The content of this article does not necessarily reflect the views of these organizations.